Sprint Mart Rewards is like FREE money. With Sprint Mart Rewards, you earn points on the things you already buy like fuel, snacks, and drinks; and redeeming points is easy, you spend points just like cash. You can also join exciting Club Programs, earn Random Rewards, and receive fantastic Member Deals! The best part, it’s all FREE; there’s no cost, no obligation and no long-term commitment. Sprint Mart Rewards is our way of saying Thank You! We simply want to keep you coming back. Join Sprint Mart Rewards by visiting any Sprint Mart and request a Free Sprint Mart Rewards card from any Team Member. Complete your registration by Enrolling your card at the above link. We need some basic information: name, address, etc. ; that’s all. 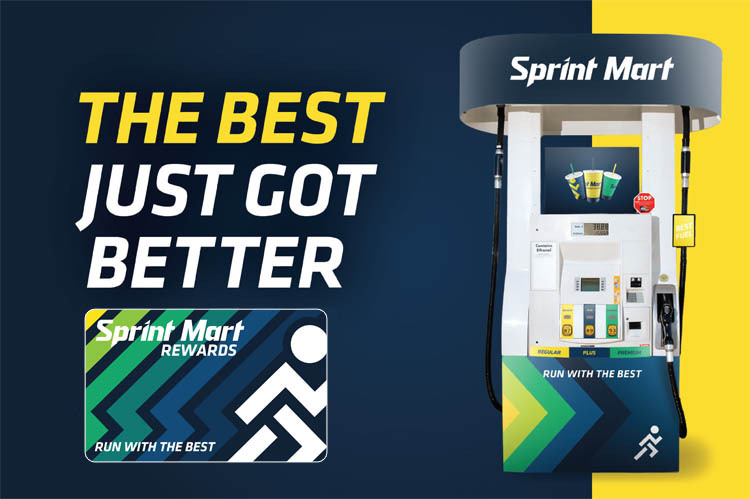 Swipe your Sprint Mart Rewards card at the pump and in-store on every transaction when prompted for loyalty. You will earn 1 point per gallon and 2 points per dollar spent inside the store. Exclusions apply, see Team Member for details. Points are spent like cash (100 Points = $1.00) on products or fuel at participating Sprint Mart locations. Points are earned inside or at the fuel dispenser, simply swipe your card when prompted, that’s all you have to do. Points can be spent for fuel or convenience store merchandise but all points should be redeemed inside the store. The process is quick and seamless. You earn and spend points with ease. You will automatically enroll in Club Programs on your 1st purchase of a Club product. Once you reach the Club threshold, you will automatically receive your next one free! Every single transaction is an opportunity to earn a reward, such as a Transaction Reward, Random Reward, or even an opportunity to be entered into a Sweepstakes to win a valuable Prize! Requirements: Members must be 13 years of age and have completed the registration form through the Enroll link above. So go ahead and sign up today, you’ve got nothing to lose and points to gain. It’s FREE and it pays you to shop for the things you already buy. Wow, the Best just got Better!